Deb's Cup of Tea: Do I HAVE to clean here? I took a photo off the wall of the living room in order to scan it. Carole got me involved in Farktography, which is a weekly online photo contest. There is an upcoming contest which I feel this particular photo exemplifies. 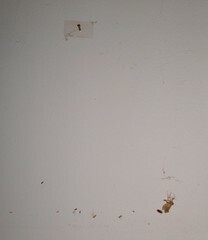 When I removed it from the wall, I found the residue you see there. Obviously, some spider had made a home behind this photo and had a small repast before either expiring or moving on. I dusted off the wall and rehung the photo once I'd scanned it. But it got me thinking. How many of my readers remove the photos on the wall and dust behind them? I dust frames, even clean the glass on the photos once or twice a year. But take them down and dust behind them? No. I looked around my house. I have a lot of things hanging on the wall. I'm fond of displaying things and the walls are festooned with photos, knick-knacks and art. I could take it all down and methodically clean behind it, but that's not exactly something I want to do. Still, thinking about what could possibly be behind some of these photos has me considering devoting a morning to deep dusting. This is something I could do during Saturday's football game. I wouldn't have to leave the living room, although, if the Hawkeyes play badly, I might want to leave the living room.